Special licenses are System users, Owner logins and AP02's (US only). Adding them to your subscription usually requires your agreeing to any extra charges and having vintrace add the license to your subscription. Additional charges for System users only apply if you are adding more users than is included with your level of subscription and certain add-on modules. Once the license is added, any user with Local admin permission made create the new entries in the Address book. For more information on managing your license/subscription, click here. Fill in the user’s first and last name, email and phone number. This information is helpful to the vintrace support staff in communicating with winery staff. At the minimum, set the Operator role so that work may be assigned to this user. Note the Permissions on the right. 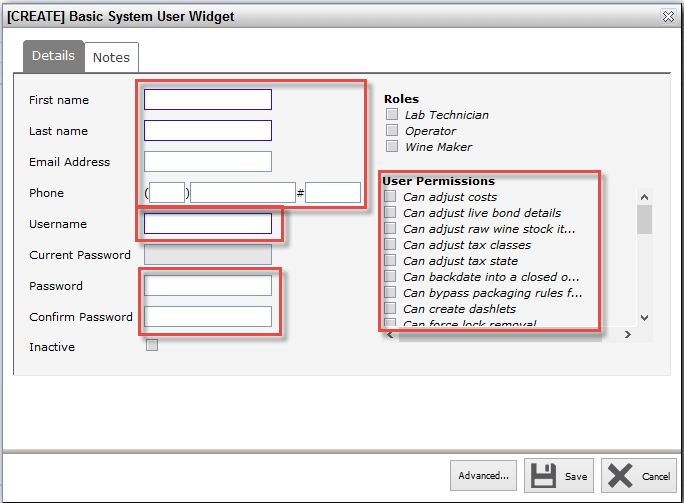 When adding a new System user, vintrace assigns a set of default permissions. Click here for information on what each permission allows; including the default permissions. As a local admin, you may add or remove any of the permissions; removing all creates a view-only user. The goal is to ensure the user has sufficient permissions to perform their job without allowing them to perform actions not appropriate to their job. We do ask that you do not assign Can create dashlets, Enable API login or Force unlock. Note: Users may change their password at any time: head to Tools > Change Password. As the local administrator, you can’t recover a lost password, but you may change the password. This is also a good way to cut off access to a user for administrative reasons. We typically recommend assigning a temporary password (your 3-letter client code plus the current year [jx22019]); set the Force password reset next login as shown below. When you are satisfied, Save. 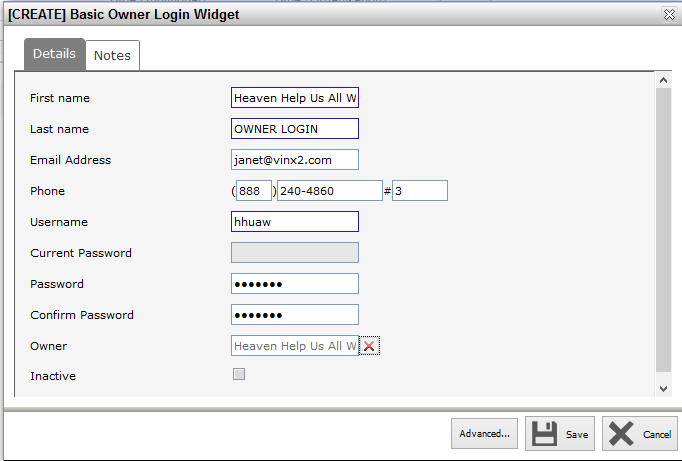 Send your user information on their username and password. It's also a good idea to send the url's for accessing your database. Under US law, clients who make wine at your facility under their bond can be set up as an AP02. This bond will always take precedence over your bond as your client will be operating as a winery-within-a-winery. After your client has received their AP02 bond number, you may create their special AP license in vintrace. Head into the Address book > Add > Organization. In the Company name field, enter the client's business name, followed by AP, or -AP or something similar. This helps differentiate between APs and other owners. Complete the email, phone and address. From the list of Roles, check Owner, then click Edit. Assign an Auto code (short code) that can be used in any Auto code where the owner is used. Check AP owner and click the Add/new tool (*+). Fill in the TTB bond info as shown. Note: the Employer ID # (EIN) is required for your client's TTB reports; here is where you set it. If you don't have all the bond information, fill in as much as you can. You may return to the TTB Bond info screen by clicking the edit tool (pencil). You will want to have all the information entered here before you run this client's first TTB report. If your client has bulk wine that needs to be transferred over to the new AP02, click here. To run an AP02's TTB reports, their bond will be available from the drop down bond list in TTB Report of Wine Premises Operations (TTB report), Tax Breakdown Report and State Government Tax Class Report in the Government Reports menu.